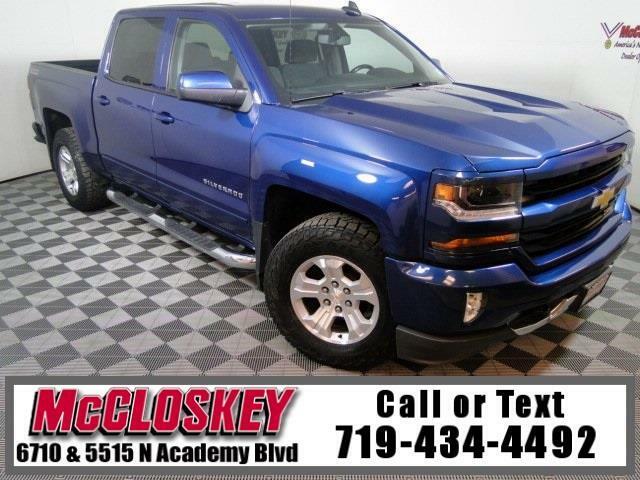 Luxurious 2016 Chevrolet Silverado Crew Cab 4x4 with Z71 Package, Remote Start, OnStar Navigation, Backup Camera, Trailer Brake, and Heated Power Seats! Stepping up to the LT adds an "E-Z" lift/lower tailgate, alloy wheels, body-colored door handles and mirrors, cloth upholstery (with adjustable lumbar support for the driver), carpeting, a leather-wrapped steering wheel with audio controls, an upgraded driver information display and an 8-inch touchscreen with HD radio, satellite radio, a CD player and Apple CarPlay (Android Auto comes later in the model year). Powering this Chevrolet Silverado 1500 is a 5.3L V8 Engine 355 horsepower and 383 foot-pound of torque!